From Forest to Farm and Back Again explores the history of land use from colonial settlement to the emergence of modern America at Harvard Forest in Petersham, Massachusetts. Students will examine, interpret, and analyze physical and cultural patterns of forest use and management over a 300-year period. Lycoming County Historical Society, PA. The student will understand how the values and institutions of European economic life took root in the colonies. The student will understand the impact of the American Revolution on politics, economy, and society. The student will understand the impact of territorial expansion between 1801 and 1861 on communities in the east. The student will identify and use processes important to reconstructing and reinterpreting the past, such as using a variety of sources, providing, validating, and weighing evidence for claims, checking credibility of sources, and searching for causality. The student will examine, interpret, and analyze the physical and cultural patterns and their interactions, such as land use, settlement patterns, and ecosystem changes. Download and Print Module 2: one Teacher pages copy & one copy per student of the Student pages PDFs using Adobe Acrobat. What do you think the condition of the woodlands, grasslands or desert ecosystems was when Europeans first began settling this area? What do you think the ecosystems would have been like 100 years later? What would have been the primary cause of the ecosystem change? Students will analyze an essay timber harvesting and forest regeneration in Petersham, Massachusetts. Hand out From Forest to Farm and Back Again. Worksheet 1 will help students understand the key concept vocabulary. Worksheet 2 will give students the opportunity to organize the essay information in their own minds. Students will analyze several historical documents that add substance to the story of timber harvesting and regeneration. Have students read the History of Petersham. Worksheet 3 will give students the opportunity to extract the eye witness information embedded in the historical document. Hand out the Population Density Maps. Worksheet 4 will give students an opportunity to use mathematical concepts to extract information from graphic data. Handout the Forest Succession Diagram. Worksheet 5 will give students the opportunity to comprehend the concept illustrated by the diagram. Teachers can choose from one of three types of activity assessments. Organize field trips to two different forests, one managed by industry and one managed by state parks. Compare and contrast the forest management activities and the condition of the forest. Research the 400 year history of a local forest. Technology: Have students create a Power Point presentation describing the changes to the forest ecosystem (clearing forests, farm abandonment, return of second-growth forests) in Petersham, Massachusetts following the arrival of the Europeans. English: Using the Essay, the historical record (The History of Petersham), and Worksheet 3 as a guide, ask students to create 3 short, fictional, first-hand accounts (in the form of journal entries) that describe the physical landscape of Petersham, Massachusetts in 1700, 1740, and 1850. In addition to describing the changes in the land, students also should speculate about how alterations in the landscape may have affected the daily lives of people in the area between 1700 and 1850. Math: Since Worksheet 4 incorporates math skills, this exercise could be introduced in a social studies class and completed in a math class. Alternatively, math teachers could build upon this activity by having students analyze and answer questions regarding historical maps that require similar mathematical skills. 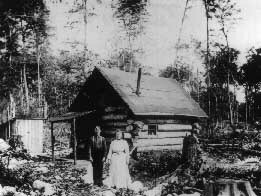 Science: Because a major theme of the activity focuses on how the arrival of Europeans affected the various forest ecosystems over time, science teachers could have students study how either plant life or wildlife changed in a local forest (following European colonization) as a result of human interaction with the land between 1700 and 1850. Clawson, Marion. Forest Depletion and Growth. Encyclopedia of American Forest and Conservation History. Edited by Richard C. David. New York: Macmillan, 1983. Foster, W.H.H. Stepping Back to Look Forward: A History of the Massachusetts Forest. Edited by Charles H. W. Foster. Petersham , Mass. : Harvard Forest, Harvard University, 1998. Foster, David, Glenn Motzkin, & Benjamin Slater. “Land-Use History as Long-Term Broad-Scale Disturbance: Regional Forest Dynamics in Central New England.” Ecosystems 1 (1998): 96-119. Tager, J. & Wilkie, R. A., Historical Atlas of Massachusetts. Amherst, Mass: University of Massachusetts. 1991. Whitney, P. Worcester County: America’s First Frontier. Worcester Mass: Isaiah Thomas, 1793. Harvard Forest A base for research and education in forest biology, silviculture and forest management, soil , forest ecology, and economics.